Raul Castro, head of the ruling Communist Party and former president, said that in the wake of Venezuela’s economic collapse, Cuba’s economic situation “could get worse” in the coming months (Miami Herald/CFR) and that the diversification of the economy could be affected. Venezuela’s economic subsidy reached its peak at about 12 percent of Cuba’s gross domestic product. During the boom years, around 90,000 barrels of crude oil daily, representing $9 billion annually, were sent to Cuba. 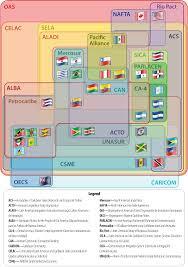 Some estimate that over approximately 15 years, Venezuela has subsidized $35 billion in oil to Cuba. Important government decisions are being made in Havana, not in Caracas. The Castro regime’s tentacles extend to several Venezuelan governmental institutions, including the armed forces and the offices of immigration and health services. Exports of professional services (e.g. doctors, nurses, teachers, and other healthcare and educational personnel) represent the principal source of hard currency for the Cuban government, adds Mario A. González-Corzo, Asso­ciate Pro­fes­sor in Eco­nom­ics and Business at The City Uni­ver­sity of New York (CUNY). 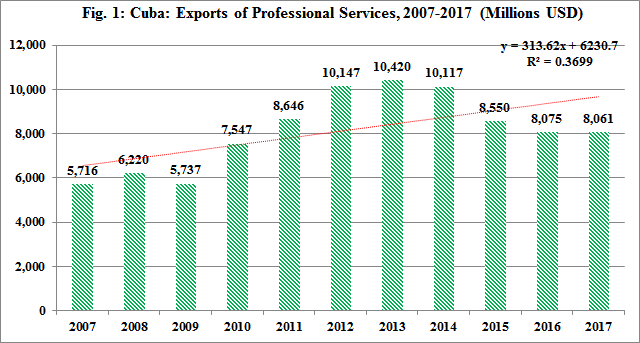 As Figure 1 indicates, in 2007, Cuba exported an estimated 5.7 billion USD in professional services; this figure reached approximately 8.0 billion USD in 2017, representing an increase of 41% during the 2007-2017 period, he writes for Cuba Insight: a publication of the Cuban Studies Institute.